Much like many other cities of India, Amritsar has seen a massive jump in the number of vehicles while the road infrastructure is just not capable of handling the traffic. This leads to chaos, stress and tussles in the middle of the road over petty and large matters. The Government of India made it mandatory to have at least a third-party liability policy for two-wheelers. This ensures that at least the costs incurred by a third-party in an accident will be covered. But given the state of things, it’s a smart move to take a comprehensive policy that will also cover costs of own damage, injury, disablement and death. There is an abundance of insurance companies flourishing in India. Many of these companies perform in the top ranks and provide customers a plethora of options that are designed specifically for different customers. In Amritsar, customers can opt for a two-wheeler insurance policy from any of these companies. Through tie-ups with garages, insurance providers are able to provide cashless settlements to customers. This facility has a number of benefits and works in favor of all parties involved. Some of the main benefits of cashless garages have been listed below. Quality Service - Availing repairs and services from network garages guarantees quality service as the garage is connected to the insurance provider. Simple Process - There is minimal hassle involved with cashless claims. The customer can contact the insurance company through the customer care. Once the claim is approved, the garage and the insurer will handle the rest between themselves. Fast Approvals - Once the cashless claim request is sent, it takes a few hours to get an approval or in some cases, a rejection. In other cases, the company may request for more information. Upon providing the required details and documentation, it shouldn’t take more than 24-28 hours to receive a response. Quick Settlements - Most two-wheeler insurance companies have a separate department that is dedicated to cashless claims. Once the repairs are completed, the settlement of the bill is handled between the insurance provider and the garage. Less Expensive - Customers only need to pay for any part of the bill that is not covered under the insurance policy. Furthermore, customers do not have to bear any expenses for visiting a branch and filing for a claim. Less Paperwork - Since the garage and the insurance company already have a communication system, there is minimal documentation required from the customer. The garage will send all necessary documents directly to the insurance provider. Many people just blindly pick up any bike insurance policy because it is mandatory. Not having a valid insurance policy on your two-wheeler could result in fines being imposed by the police. 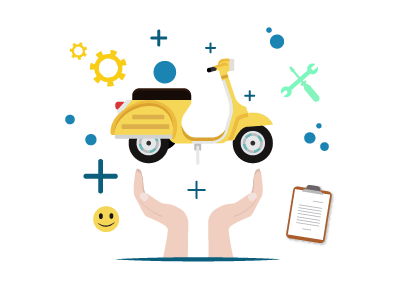 While buying a two-wheeler insurance policy, there are a number of factors that need to be considered in order to get adequate benefits for the cost of the plan. Premium Details - Every insurance plan costs money. The payment made to purchase or renew the plan is known as premium. Premiums are based on the age of the vehicle, accident history, the cubic capacity, driver’s details, location of purchase and registration, among other things. One needs to take into account the cost of the plan, the premium payment frequencies and payment modes available. Generally, for a two-wheeler policy, you will be required to pay a single premium for an annual policy term. Scope of Protection - Customers can choose from two options of cover when it comes to two-wheeler insurance: a liability-only policy and a comprehensive plan. With a third-party liability policy, only damages, injury and death caused to a third party will be covered. If you choose a comprehensive package, then you will also be covered for own damages. Also, opt for an adequate sum assured. Maximum Claim Limit - Insurance providers will pay only a certain limit in damages and liabilities. When it comes to comprehensive policies, the limits will depend on the premium paid, the sum assured and the coverage opted for. For claims on damage to third-party property, the insurance amount is capped at Rs.1 lakh. For death caused to a third party, there is usually no limit. Settlement Options - Cashless settlements are the easier option when it comes to making insurance claims. But this means the customer must avail the services only from a network garages. Under reimbursement claims, a customer can get the bike repaired at any garage of their choice, pay for the bill and then claim a reimbursement from the insurance company. Policy Terms - Generally, two-wheeler insurance plans have a term of 1 year, but some companies also offer 2-year and 3-year terms. Opting for a longer term is beneficial as you do not have to renew your policy every year, and furthermore, you will be protected against rising premiums on third-party insurance as declared by the IRDAI from time to time. Exclusions - There are a number of circumstances mentioned in the policy under which the insurance company will not be liable to pay any claim. General exclusions include driving without a valid licence, driving under the influence of alcohol or drugs, damage due to war, terrorism or nuclear-related incidents, consequential losses, gross negligence in case of theft, and so on. Deductibles - Some insurance policies will require a co-payment in case a claim arises. A deductible is your share of the claim amount that you will have to bear. Choosing a high deductible will lower your premiums, but this will also mean you have to pay a higher sum when a claim arises. A lower deductible will increase your premium, but when you make a claim, the insurance company will cover majority. When a two-wheeler is sold, the seller and the buyer must complete the transfer of ownership so that the buyer becomes the new registered owner. This will ensure that the seller is not responsible for any liabilities that may arise in connection with bike in the future. To complete the legal process, one needs to submit a Transfer Vehicle Ownership application to the Registering Authority that has jurisdiction over the place where the buyer and seller reside or conduct business. The fee charged is half of the regular registration fee. A few documents such as Certificate of Registration, NOC, Pollution Under Control Certificate, Certificate of Insurance, proof of residence, and so on, needs to be submitted. The Registering Authority will make the transfer once everything is submitted. Contact the insurance company and request them to transfer the name of the policy to the new owner. The new owner needs to provide details and documents as necessary. If the new owner meets the eligibility criteria of the policy, then the insurance company will make the transfer.